Chad Smith's signature Pearl snare has built a reputation as a brilliant all-rounder on a budget over the last decade, and now Hawkins' Gretsch is set to do the same. Great price and looks. Superb sound. Drummers tend to like Foo Fighters, mainly because they have two of the finest rock drummers of the last 20 years in their cohort. While Taylor Hawkins and Dave Grohl's playing styles differ, they share many aspects of their playing, not least their appreciation of great rock drum sounds. So, imagine our delight when we heard that Gretsch had announced a signature snare for the one-time Alanis Morissette sticksman. Fast-forward to today and MusicRadar has taken delivery of his Hawkins-approved piece of Gretsch cratfsmanship. Brace yourselves, this will get loud. and you'll find distinction; Joey Jordison's 13"x61⁄2" Pearl, Danny Carey's 14"x8" Sonor, Abe Cunningham's vented brass Tama model. In our mind, a signature Taylor Hawkins snare has been a long time coming. Interesting then, that he's opted for what is at first glance quite a pedestrian take on the signature snare format: 14"x61⁄2", steel shell, triple-flanged hoops. "Some snares don't cope well with lower tunings, but take the black Hawk down and it works wonders." There's no crazy esoteric ideas going on here, but it's far from generic. The 1mm black-nickel coating gives this drum an air of understated expense, and the only clue that it's a signature product comes from the 'Hawk' and squiggle engraved on the Gretsch badge. Elsewhere, you get 10 lugs, and 20-strand snare wires, and the Hawk comes fitted with a Remo Emperor-X batter straight out of the box. 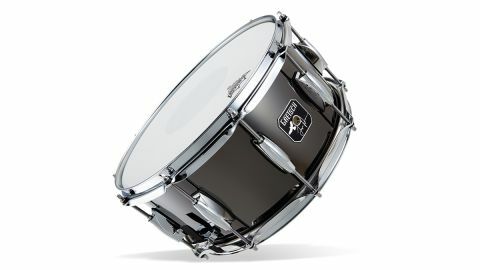 We'd have been accepting - it is a signature product after all - but disappointed if this snare could only do one thing. As it turns out, the main point we need to make about this drum is its versatility when it comes to tuning. Starting out in the middle of its range, we get a fat, loud and cutting rock sound snare. Some snares don't cope well with lower tunings, but take the black Hawk down and it works wonders. With the batter head about a turn off finger-tight, and snares loosened a bit, it delivers a low punch and full tone without any of the annoying buzzes and artefacts you sometimes get from slacker tunings, in part due to the Emperor-X. Other drum companies take note: it pays to include decent heads. Finally, cranking it up a bit takes a step towards Funkyrocktown: loud, cracking and it'll tear through walls of guitars to make sure you're heard. Cynics have an axe to grind about signature gear. How do you make a simple, affordable steel snare more appealing? Put a rock star's name on it. Well, hats off to Hawkins and Gretsch. What you get for the money here is a very good quality snare that'll have you covered for any rock scenario from singer-songwriter to metal, and probably anything outside of that too.